Let the stately presence of the Whitehall Hawthorne Oval Wall Plaque invite guests to your home. The classic styling displays your house number beautifully. This item is hand cast in recycled aluminum from a mold created specifically for your order, giving you a beautiful plaque in a single, durable piece. Personalize the plaque with up to five 3" characters. This attractive wall plaque clearly showcases your customized information, year after year. Display your specially created Hawthorne Oval Wall Plaque by mounting it to a wall. Made in the USA. 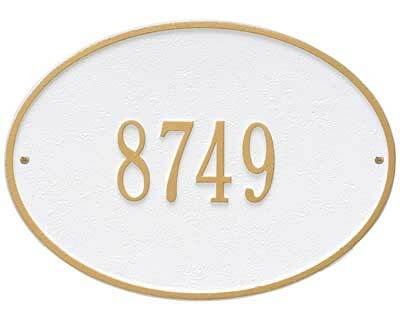 A white plaque with gold numerals is shown using the color code "WG". Simply use the color chart and spaces below to choose your style and enter your personalized line.